Gourmet chocolate-dipped Oreo® cookies, rolled in sprinkles and printed with your custom image. Each cookie is boxed individually then sealed with a chiffon ribbon. Each cookie is individually cello-wrapped inside a 2" square White Gift Box then tied with a chiffon ribbon. 2-3 Days (plus transit time). Rush Service Available. Large orders need more time. Each of these personalized Oreo® cookies is sealed in cellophane and boxed in an individual gift box with a bow. Unwrapping these printed cookies is sure to wow clients, employees, partners and colleagues. Unlike other online bakeries, we never use any edible paper in our branded cookies. We developed a new process so we could print right on the cookie or chocolate. 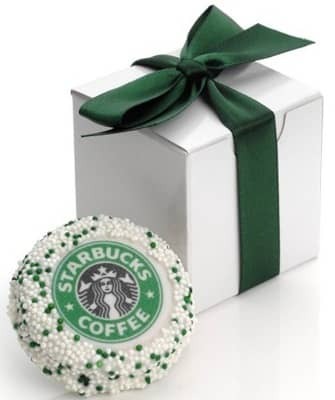 This makes sure your promotional gifts taste as delicious as they look! Large orders are not a problem. We have years of experience helping corporate clients coordinate large campaigns nationwide. If you need something special, like to include your marketing materials or other promotional gifts along with your custom cookies, just fill out a Request Estimate form. No request is too crazy - we pride ourselves on coming up with some of the most creative bakery solutions for businesses in the world!